We need your support to keep up this work. Read more at Learn how to support our work in Latin America by reading here. One of my friends in Barquisimeto works with the missions department for a major denomination in Venezuela. Each time we get together, whether it’s here in Panama or there in Venezuela, we always “put on my coaching hat” and I get to help him as coach. We spent several hours one afternoon talking about his upcoming appointment as pastor in a mountain community and brainstormed ways he could lead his new church in the work of community development while proclaiming the gospel. The Lord gave me a great time to be with this young man and his family as they seek to make a difference in this new community. In his role with the missions department, he’s inviting me to be their plenary speaker at their annual event in August of 2012. About 200 teenagers will gather for a time of intensive study about missions and evangelism. Pray that this will come to pass. Later on in the same week, he got to minister to me as I shared with him about our work in Panama and Latin America. 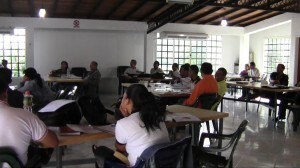 During my recent trip to teach at the Wesleyan Seminary of Venezuela, I received a short notice invitation to teach a workshop with small group leaders of a local United Methodist Church. Their pastors were students in my class. After the 2nd day, they invited me to come to their leaders retreat to spend time imparting vision and passion to their small group leaders. About 50 people had gathered in a house that had been modified for their meetings. I’m guessing at the number of people that fit in that small little room on a not too cool Saturday morning. (About half the room is pictured here). More were outside on the patio. They were gathered for their planned retreat, when the opportunity was given me to speak to them. I shared a similar message I had shared the Wednesday before at a different church, focused on the heart of God for the lost, but calling the church to develop that same passion. to seek those who don’t know Him rather than judge them for them sin. Teaching is one thing. The work of prayer is another. having a hard heart against reaching people for Christ. loosing our passion to reach the lost. The church lingered in prayer, doing the hard work of evangelistic prayer, followed by a time of intercession for people they know personally. We wrote down names on sticky notes, put those names in a basket as a symbolic offering of our labor in prayer. But that sense of God’s working wouldn’t let up – the prayer continued and continued. . .
We felt as if God was sharing His heart with us, melting our insensitive hearts, and causing some to weep over the lost. I believe that church will experience a harvest in coming months because of this work. I hope the pastor’s will send me some results a few months from now. During my trip to teach a evangelism class for pastors at the Wesleyan seminary of Venezuela, I had the opportunity to preach at a rather large church in a suburb on the other side of the mountain. 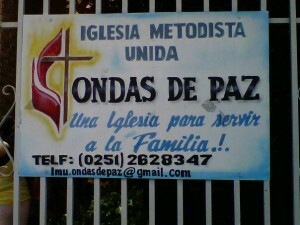 Our missionary friends in Barquisimeto arranged it for us. Getting there was a challenge. First a taxi to my friends house from where I was staying. Then the church sent a car to pick us up. 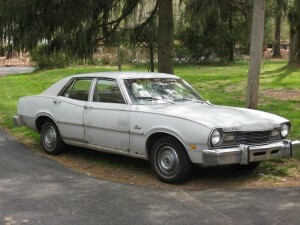 This ride was a 1974 Ford Maverick, similar to this one pictured here. I don’t remember if seat belts were even present. We could hear the motor from yards away. Even the side veiw mirrors were in a different place than where I am used to. One thing about Barquisimeto. If you have any nostalgia for beater cars from the 70s, you’ll go wild with car lust in this city. My friend told me that getting a new car takes over a year unless you pay bribes. 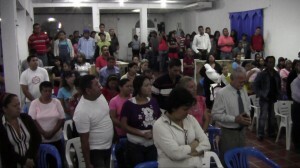 About 200 people gathered at Buenas Nuevas Cercado (Good news church in the community of Cercado) for their normal wednesday night believers service. Only about 1/2 the building in in this picture. The church had taken over a house at the end of a dead end gravel street. As an aside I was impressed with the ushers and greeters they had in place. These volunteers joyfully fulfilled their duties and ministry in this role. We moved into a time of prayer ministry, calling on God for the church’s work in the community. Pictured here, members of the worship team are asking God to use their church to make a difference in the community. People afterwords expressed to me what that prayer time meant for them. Afterwords, we visited with the pastor and his wife before I got to ride in a nice car to get back to my residence for the week. October is always busy. For the last five Octobers, it has been a series of conferences in 3 different countries, and this one is no different. 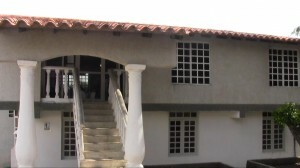 The Wesleyan Seminary of Venezuela (founded by a United Methodist Church in Georgia) has established a ministry school in the central Venezuelan city of Barquismeto. Named after John Wesley (vs the denominational tradition), the 10 year old school is non-denominational in approach and our class had several students from different denominations. Without this school, students have said there is no other place to get this kind of training. In terms of our family’s calling, and my calling in particular, – this school is the sweet spot of our calling — helping pastors wrestle and grow with how to lead evangelism in a congregation. This particular course focused on pastors themselves as evangelists, active witnesses in sharing their faith as pastors and church planters. We covered all 7 during the 32 hour class. Most of the time was spent on evangelism axioms 5, 6, and 7, with a lot of time to pray through the implications of the material. We touched on many models, methods, manners, and how to mix them all up to help create a vibrant evangelism plan in the congregation. Each student created their own plan of action to set out to accomplish at their churches in the next few months. Statements like this were repeated by others. they will lack the ability to lead evangelism training in the congregation. These students saw that they needed to start making some new friendships with unbelievers and strengthen existing ones.